It is a sad fact, but animals age much faster than humans. There is a common consensus that one human year is equivalent to 7 years for our canine companions. This is not entirely false, as it has been observed that a medium-sized dog’s average lifespan can compare to that of 1/7 of a humans. There are many factors that can determine just how long a dog can live. Two things that can affect your dog’s lifespan are breeding and care, also known as the age-old debate of nature vs. nurture. Genetics play a large part in the overall health of a dog. Just like how a dog’s genetic makeup can influence its temperament, it influences how susceptible a dog is to certain health conditions. For instance, it is commonly known that due to over-breeding, many German Shepherds and Labradors are more at risk to develop hip and elbow dysplasia. Conditions like these can have an effect on the lifespan of a dog. Although genetics can determine what a dog is more susceptible to, the care of a dog is more important. Making sure your dog gets enough exercise, food, water, and grooming is what makes sure that they are as healthy as they can be. A healthy dog is a happy dog, and one that lives a long life too. In order to determine your dog’s approximate age, two things must be taken into account: Stage of life and weight. It is a commonly known fact that larger breeds, such as a Saint Bernard, have a much shorter lifespan than smaller breeds, such as a Chihuahua. Chihuahuas can live up to 20 years, whereas a Saint Bernard generally lives up to 10. 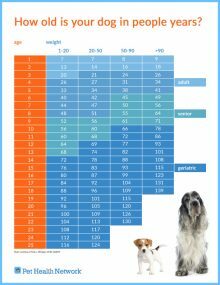 According to a chart created by Dr. Fred Metzger DVM MRCVS as your dog ages into the four different stages of life (young, adult, senior, geriatric) their age will change based on the stage of life that they are in. There is really no magic number that determines how old your dog is, it all depends on their age, health, and breed. “How Old Is Your Dog in People Years?” Pet Health Network, www.pethealthnetwork.com/dog-health/dog-checkups-preventive-care/how-old-your-dog-people-years. Nuwer, Rachel. “One Human Year Does Not Equal Seven Dog Years.” Smithsonian.com, Smithsonian Institution, 3 Oct. 2014, www.smithsonianmag.com/smart-news/one-human-year-does-not-equal-seven-dog-years-180952929/. Orwig, Jessica. “No, a Human Year Isn’t Equivalent to 7 ‘Dog Years’.” ScienceAlert, ScienceAlert, 28 Apr. 2018, www.sciencealert.com/no-a-dog-year-isn-t-equivalent-to-7-human-years.